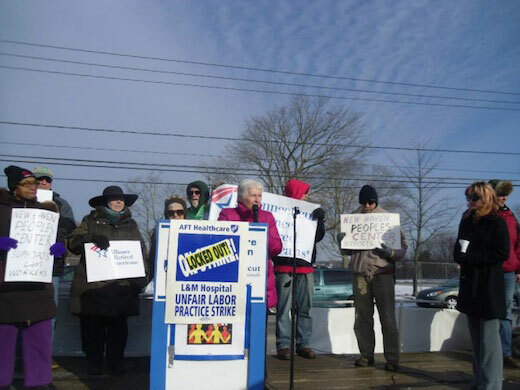 NEW LONDON, Conn. – Support is mounting daily for 800 courageous locked out nurses and tech workers at Lawrence & Memorial Hospital (L&M) here, as the corporation failed to show up for further negotiations. The locked out caregivers have created a community on the picket line with music and tents to ward off the cold wintery weather. Local residents stop by frequently with pizza, donuts, coffee and sandwiches. Down the block at the union hall of AFT Locals 5049 and 5051, committees are busy receiving strike fund contributions, toys for the children of striking families, and assisting members with filing for unemployment insurance. 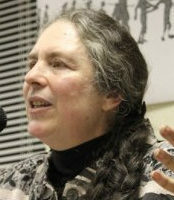 AFT Connecticut and its national union set up a militancy/defense fund that raised over $20,000.00 in days to provide relief with the economic hardship of the lockout. Last week local clergy, political leaders and advocates joined the nurses and techs for a round table discussion on healthcare access at St. Mary’s Star of the Sea Church. The local Elks Club hosted a pasta dinner attended by 350 caregivers and family members. Connecticut Building and Construction Trades Council union members organized a cookout and potluck lunch on the picket line attended by more than 300. Students from East Lyme High School organized a contingent sporting their athletic teams’ maroon colors to come demonstrate support for the hospital’s caregivers. A delegation from the Connecticut Alliance for Retired Americans (ARA) held a press conference at the picket line to add their voices of solidarity. Speaking about the needs of seniors, ARA President Bette Marafino said, “Whether we like to believe it or not, our members often need hospital services. If L&M will treat their family of employees like this, how will they treat us when we need hospital services?” ARA members from the Machinists union and the Peoples Center also addressed the crowd. The workers on the picket line kept thanking the delegation for coming out in the cold to show support. In picket line conversation the caregivers expressed determination to stand firm on principle for union representation and quality health care, citing Nelson Mandela as an inspiration. Instead of sitting down at the bargaining table to settle the dispute, the corporation cut the workers off of health care coverage. In response the federal labor department’s employee benefits security administration is helping those who have no other options obtain medical and dental insurance through COBRA. The corporation is waging war against the caregivers in the local media with full-page ads distorting the facts to imply that it is the union workers who are not willing to negotiate, and create a climate of mistrust among the caregivers and the entire community. They are attempting to negotiate by e-mails and through the press instead of at the bargaining table. The union placed an “open letter” in the New London-based newspaper, The Day, to the board of directors appealing for them to take action and get their CEO and hospital managers to end the lockout, return the caregivers to their patients’ bedside, and restore the community’s trust in their community hospital. “This community understands that we’ve always been there for them,” said Stephanie Johnson, an L&M sleep lab technician with 12 years of bedside care experience. “They’re not falling for all the false and misleading claims that hospital management keeps making about why they’ve locked us out. We want them to know that we appreciate their trust in us,” said Johnson, who also serves as Local 5051’s president. “I knew I had to stand up for my community and for my patients,” said Alison Silva, a CAT scan technologist with 10 years experience at L&M Hospital. “I am 35 weeks pregnant and the corporation has canceled my health insurance. I still think we are doing the right thing, but I just can’t believe they would be so cruel,” said Silva. The popular picket line chants, “We are all L&M” and “patients before profits” tell the story that caregivers and community are coming together and standing strong.